The gaming PC that made us famous now ships in just two business days! VR Ready. Featuring 8th gen Intel Core Processors. At Velocity Micro, we build powerful, enthusiast-grade PC’s. After you submit your order, our engineer’s assemble your rig. They double check every system to make sure it’s the best computer you’ve ever owned. The critics agree, which is why our custom systems received more than 70 awards. You can’t rush perfection, but you can get your perfect system faster. Our quick ship options leave our facility and are on their way to your home or office in as little as two business days. 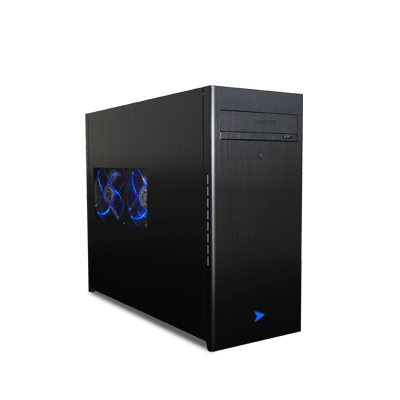 Our pre-built collection features our most popular gaming and enthusiast rigs. To ensure quick shipping, we limited some options, but offer choice where it counts. We still test every system extensively, but with fewer choices, our engineers know what to expect. But, limited choices don't have to mean limited power. These are the high-quality gaming and professional rigs you’ve come to expect from us. Velocity Micro computers come with lifetime phone support from our American call centers. We do things differently because we're committed to doing things right. Why settle for a bland preconfigured box when you can get a custom gaming PC just as fast?